cryptonaut-in-exile: Horror of Fang Rock - "Don't fire until you see the green of its tentacles." Horror of Fang Rock - "Don't fire until you see the green of its tentacles." The superstitious and the 'modern' face an alien invader in a lighthouse off the coast of England in the early 1900s, but every human in this story meets the same fate, eventually. Reuben ("Stubborn old mule. 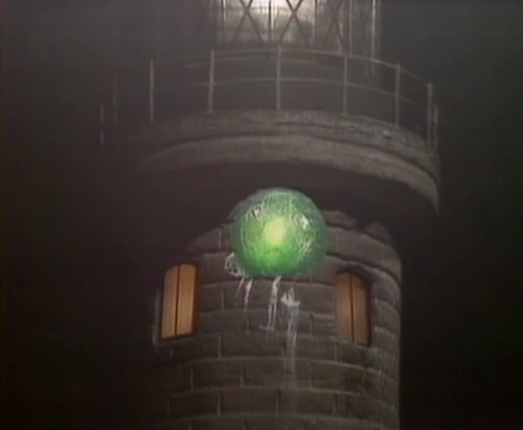 "), Vince, and Ben, are the crew of an electric lighthouse with nothing much to do but chat about the virtues of oil versus electricity for powering lighthouses until a red object, witnessed by Vince, streaks across the sky and crashes to Earth. 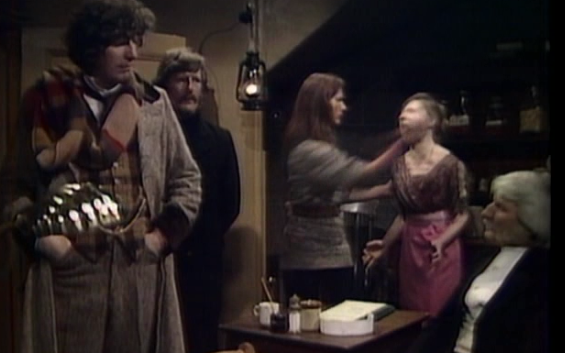 Shortly thereafter, a cold fog rolls in, they experience power interruptions, and Ben has gone missing just as the Doctor and Leela turn up, slightly off course from their planned arrival in Brighton. A shipwreck brings some upper class toffs for the Doctor to barely tolerate. Their arrival also brings a subplot about the incompetence and criminal scheming of one of their number. Leela's threat to cut the heart of the dangerously stupid, entitled, and arrogant one, Palmerdale, and the Doctor's smiling reaction to her threat may be a best thing I've seen on Doctor Who in a while. This is another episode where Leela shines. Her savage background is a handy way to send up bogus civility and prudish mores, as she does when asking for some clothes, men's will do fine thanks, and immediately starts unbuttoning to the shock of poor Vince who doesn't get to socialize much with womenfolk. Leela has enough of her screaming and fainting. The atmosphere is brilliantly realized. We're immersed in thick fog, dark shadows, and the sound of waves crashing against the rocks is punctuated by the deep bass of the fog horn, sound that gets you in the midsection and makes you uneasy almost without realizing it. The fog and dark help make this a claustrophobic story. It's as tight as any with, I think, only five different settings: the lamp room (and surrounding catwalk), crew room, Reuben's room, the boiler room, the stairway, and the rocky immediate surroundings. The Doctor quotes Leela a different passage as they depart, the Rutan menace dealt with thanks to Palmerdale's diamond stash and the Doctor's ingenuity, I just thought this worked well to establish the mood as well. There's nothing to complain about in this story. It's a showcase for Leela, the Doctor is engaged and decisive in the resolution (as is far too often not the case), and the story moves along briskly layering the Rutan's strategic retreat from the Sontaran's over the machinations of Palmerdale and, to a lesser extent Col. Skinsale. We see a thoughtful bit of interplay between the young and the old, the superstitious and the progressive, in the early going, giving us a sense of the lives and times of the crew of the lighthouse that makes them more than just Rutan fodder later. The visuals and audio effects support the story and the atmosphere quite well, partly because of the limited scope. It all comes together nicely with the reference to Gibson's poem like a bow tied on top. Following "The Talons of Wen Chiang," it would've natural to expect a let down, and while Adelaide's hysterics are annoying, they're dealt with hilariously; it's really only that the supporting characters aren't quite as dynamic and colorful as some of the other classics from this era where this one falls even a bit short.